This is a smooth and creamy, fruit flavored smoothie that doesn’t taste a bit like an avocado. As a barely reformed non-avocado fan, trust me, I would not enjoy this in an avocado flavor! I finally succumbed to the avocado smoothie craze and decided we needed to try it. My boys were giggling as I scooped out an avocado and added it to this smoothie. You would think that after years of green smoothies, they would stop thinking it was so amusing to add random ingredients to their smoothies. However, they still think it’s fun to watch the drink change colors. I used apple concentrate, simply because I had some in the freezer after making the Honey Apple Vinaigrette earlier this month. If you don’t have it on hand, feel free to substitute a cup of your favorite juice in place of the water and concentrate. My kids inhaled this smoothie and declared it a success. Although, my oldest did remind me that nothing will every top his Favorite Green Smoothie. Layer ingredients into the blender and puree until smooth and creamy. Enjoy! 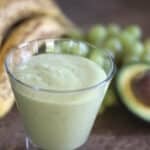 I haven't tried avocado in a smoothie, and I love them! How have I never thought to add avocado to a smoothie! I bet it gives the best texture. I still want to see a rainbow of your smoothies all lined up next to each other! I can't eat avocados, but I do think they're a natural for a smoothie...it's a fruit, isn't it? Not sure. I have yet to try avocado in my smoothies but as a lover of them on their own, I don't think I would even mind the flavor. If it even came through that is. I love smoothies. Ben's been obsessed with protein shakes lately! This smoothie is full of nutrition . 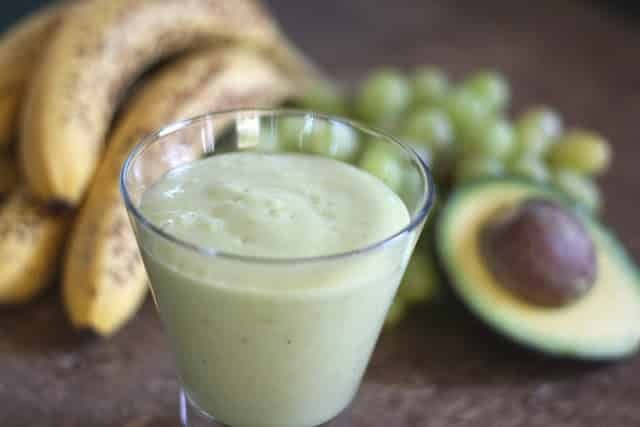 I love avocados in smoothies, in fact when I was a kid that was probably my favorite smoothie :) This looks great, I don't think I've ever tried adding grapes before - good idea!